Microsoft Surface will finally break into the market. But whether the new tablet has a chance against the current leaders? 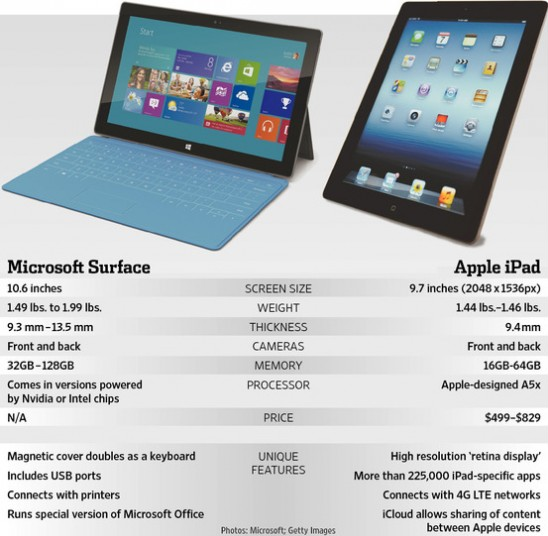 We compare the surface with Apple iPad! The two tablets are different in every respect. First, the operating system is a completely different course each, but also in design, there are big differences. Both surface as well as the iPad are handled fairly well, the Apple tablet has an aluminum body and the Microsoft device one of magnesium. Surface has numerous ports, including a USB 2.0 port, microHDMI output and a microSD card slot. The iPad, however, only the classic pin connector can be found. In general, the iPad is much easier kept while in Surface and Windows RT has many options - both have their advantages and disadvantages. Once the Microsoft range of apps in Windows 8 Store gets a grip surface and could also have other tablets with the new operating system a real chance in the market. What do you think?